INVISIBLE is more VISIBLE than VISIBLE. LOGISTICAL logistic LOGIC not as the world gives, but as the HOLY SPIRIT PROVIDES. now PLEASE tell me what you got in one word as you did before, but do NOT use the word "logic" or any synonyms, or antonyms, or paraphrase, or a similar thing, if you could. This is not a DARE or CHALLANGE, just a request. 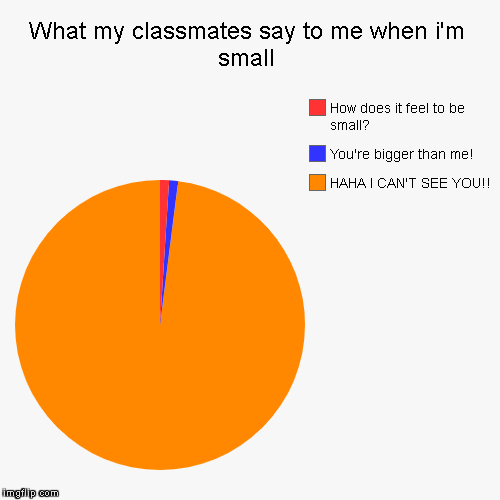 What my classmates say to me when i'm small | HAHA I CAN'T SEE YOU! !, You're bigger than me!, How does it feel to be small?